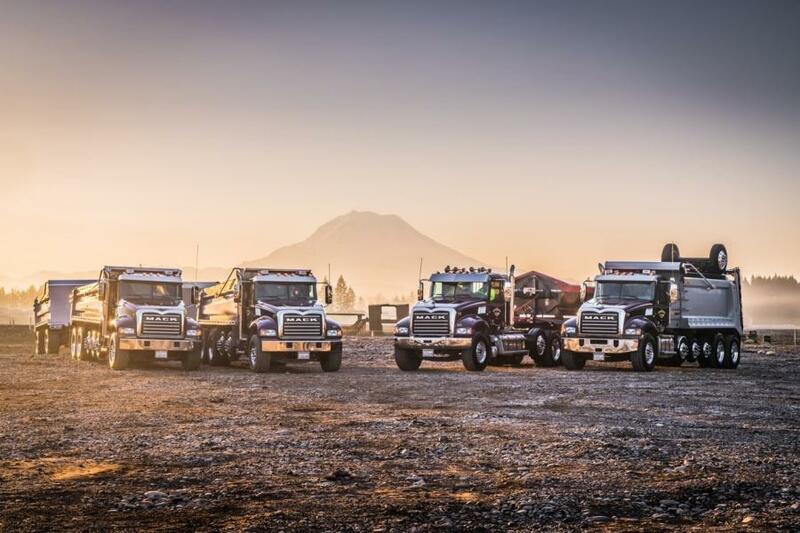 Maple Valley, Wash.-based Silver Streak Trucking depends on its fleet to meet customers’ needs in the ultra-competitive Seattle area construction market, which is why it relies on Mack Trucks and its uptime solutions. Operating in the ultra-competitive Seattle area construction market, Maple Valley, Wash.-based Silver Streak Trucking depends on its fleet being ready to meet any challenge. That's why Silver Streak relies on Mack Trucks and its industry-leading uptime solutions to keep its trucks on the job. "Time is money, and having trucks on the job working is how we survive," said Tina Benson, president of Silver Streak. "Customers in our area are looking for fleets that can handle hauling from point A to point B safely, efficiently and on time, and Mack helps us accomplish that." Silver Streak has built its business on hauling sand, gravel, rock and other building materials to job sites, as well as hauling waste materials away. Customers expect timely deliveries without interruption. "Mack has always been a durable truck for us," said Kevin McCann, Silver Streak fleet manager. "With the addition of MackGuardDog Connect and Mack Over The Air, we now have trucks that can not only notify us of issues before they become major problems and impact our customers, but also receive software updates wirelessly." With lost productivity resulting in significant costs per day, an unplanned downtime event can be one of the single largest expenses heavy-duty trucking customers face. Mack's GuardDog Connect telematics solution helps reduce downtime by proactively monitoring fault codes that could lead to an unplanned visit to the dealer or even shut down or de-rate a truck. When GuardDog Connect detects a potential issue, it notifies Mack OneCall agents at Mack's 24/7 Uptime Center, many times before a driver realizes there is a problem. The OneCall team quickly diagnoses the issue to determine the best course of action. If a repair is needed, proactive repair scheduling and parts confirmation is initiated, all while the truck remains on the road. In addition, all stakeholders, from the designated customer contact to the dealership, are kept up to date through the ASIST communications platform. "I can see unplanned events on my mobile device, including how long a truck has before a possible de-rate situation," said McCann. "That allows us to know if the truck can finish the job and when it needs to come in for service, so we avoid the hassle and expense of towing, not to mention the lost income from a truck that's down. Thanks to GuardDog Connect, we've never experienced a de-rate event out in the field." If the issue is software related, Mack Over The Air is able to deliver remote software downloads via GuardDog Connect. Working with Mack OneCall agents, the updates are scheduled for when it works best for the customer. "We're running long hours, especially in the summer, so it can be an issue to run to a dealer for a simple software update," said McCann. "Mack Over The Air allows us to schedule and conduct updates when it's convenient for our staff, saving us time and money." Silver Streak Trucking traces its roots to the late ‘50s and ‘60s when Benson's grandfather and father were hauling landscape materials and gravel. Building on that expertise, Silver Streak was founded in 1982 with just a single truck. Today, Silver Streak employs more than 70 people and operates a fleet of nearly 60 trucks, the majority of which are Mack Granite models. "We're a close-knit family business — my son is now driving for us — and we depend on our trucks to be up to any challenge we throw at them," said Benson. "That's why we chose Mack. The combination of durability, driver comfort and uptime is unbeatable."